Develop the guts to deal with teen drama with gusto with this hilarious card game. You're complaining to your friends about the gym teacher at your school...when you realize he's right behind you. You're texting your friend while walking home from school when you trip and faceplant into a fountain. You think you see a friend coming up the street, so you wave like crazy and yell her name...then you realize it's not her. When being a teen just can't get any tougher, those awkward moments remind us that there's always room for extra embarrassment. If only we knew what to do right when humiliation strikes to it shake off, no sweat. Think of this game, awarded the National Parenting Center's Seal of Approval, as your first defense against the awkward experiences you'd do anything to avoid. Cards packed with mortifying moments encourage players to face social faux pas head on. Reaction cards pose a variety of ways the player could react when blush-worthy situations strike. 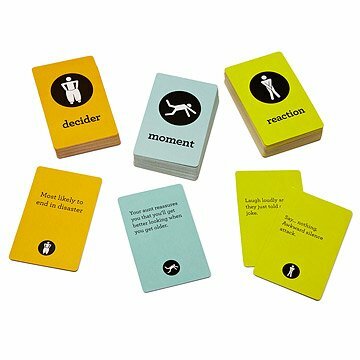 The decider chosen for each round draws a decider card that encourages players to choose the best reaction based on constraints, such as "What a teacher would most likely tell you to do," "What the decider would least likely do," "Most responsible," and "Silliest." The reaction that appeals most to each round's decider wins and the player keeps the Moment card. Collect the most cards to triumph over those oh-no moments and to win the game! Printed in China. Mary Flanagan is an artist and professor at Dartmouth College who founded the research lab Tiltfactor to "tilt" us out of old game models and invent new ones. Mary and her top-notch team of social psychologists, graphic designers, game designers, technologists, and students design innovative games that incorporate psychological principles to change the way people think and feel about issues in domains such as public health, social commons, and societal biases and stereotypes. Curated for the hard to buy for. Lovely selection of eclectic gifts. Perfectly offbeat. I love it's interactiveness with young people and adults alike. It can initiate some talking points about real life awkward moments. We play this on family nights with our teenage sons. Lots of laughs and fun. Looking forward to using it with bigger teen gatherings. Only drawback is that so many cards that it would be great to have some type of holder for play cards/discard cards. Cannot honestly rate as it is a Christmas gift for my niece. My Daughter loved this gift. We played the game immediately after she opened it with a friend of hers. Both girls loved the game and I expect it to become a regular source of entertainment in our home. This game is fun and super funny!! I know my kids will love it!! We played this game soon after my friend's son received it. We had a blast!! We couldn't stop laughing at the situations and reactions! I keep talking to people about it. We bought this for my teen son as a birthday gift. We all played it together and it was pretty fun, however, not as gender neutral as I had hoped. There were a lot of scenarios that were clearly only for girls and very unrelatable to my three boys. My K is enjoying this game with her pre-teen friends.